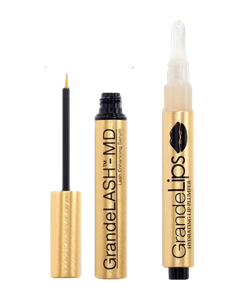 GrandeLASH-MD is infused with a proprietary blend of vitamins, antioxidants, and amino acids, promotes naturally longer, thicker looking lashes in just 4-6 weeks, with full results in 3 months. It’s a cult favorite for helping to enhance short or thinning lashes and is also ideal for restoring the appearance of brittle or damaged lashes. It is easy, safe, & effective, ophthalmologist tested & approved, and can be used with contacts & lash extensions. GrandeLIPS’ unique cushion applicator easily wipes clean & can be used along with other lip products. GrandeLIPS Hydrating Lip Plumper is formulated without parabens, sulfates, phthalates and is gluten-free. A high gloss, volumizing lip treatment with instant and long-term hydrating and plumping benefits. Infused with a nourishing cocktail of Volulip™ & Hyaluronic Acid, this plumper instantly improves lip volume in 3-5 minutes, hydrating dry areas.